Maybe you are going to a party this holiday season and want to bring something simple but delicious. This might be something for you. 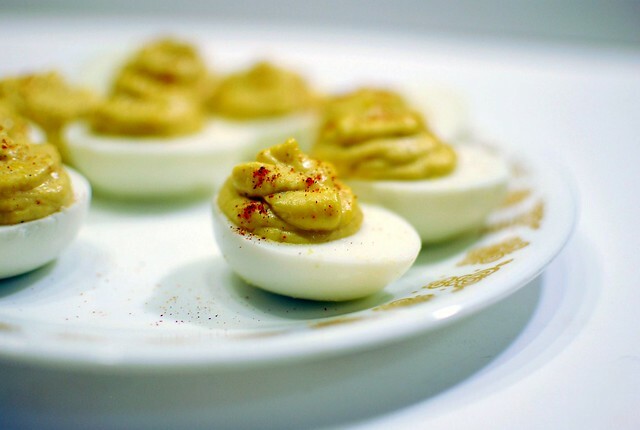 I feel like people don't love deviled eggs as much as they used to a long time ago, but I can't imagine why. They're pretty, cheap, easy, simple and quick to make a whole lot at a time. I threw the horseradish in for extra punch, which Alex liked. I think his exact words were "that's just what the back of my throat needed". Hard boil your eggs - set them in a pan of water, cover with an inch of water, and bring to a boil. Cover, turn off the heat, and let sit for 13 minutes-ish. Run cold water over the eggs to cool them off, then sit down with the eggs and a bowl in front of the tv, and get to peeling. Once the eggs are peeled, cut them in half and scoop out the yolks. Mash the yolks with the mayonnaise, mustard, and horseradish until smooth. Add salt and pepper to taste, then sprinkle in some paprika. Scoop the yolk mixture into the egg whites, and sprinkle a little paprika over the top for color. 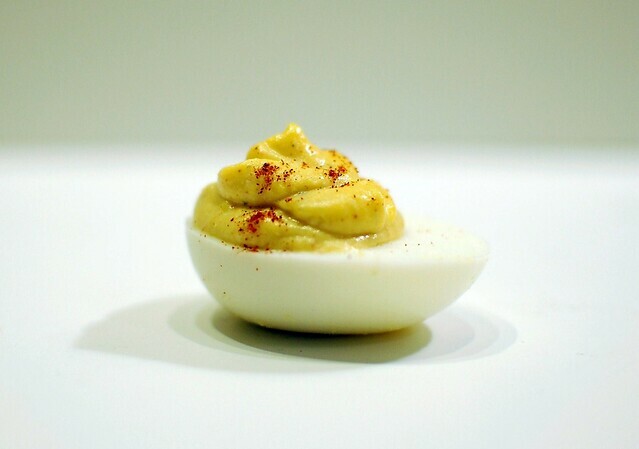 Man, I love deviled eggs!